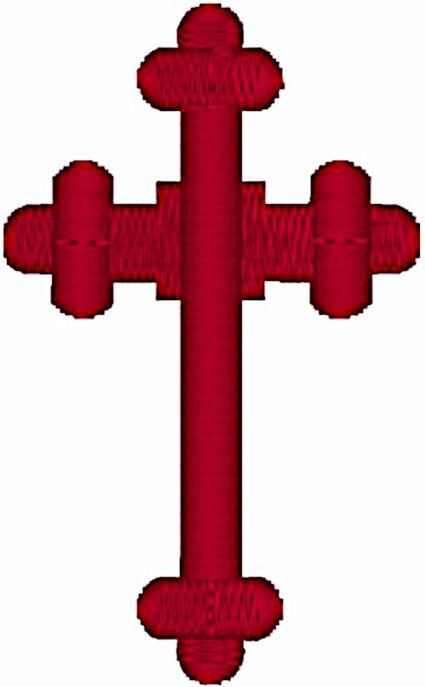 The budded cross is also known as the Apostles' Cross, the Treflee, Botonee or Cathedral Cross and there are many styles. In this version the three 'buds' on the ends of the arms represent the Holy Trinity. The sewn out size for the 2.40" x 1.60" hoop is .61" W x 1.00" H with 467 stitches. The sewn out size for the 4" x 4" hoop is 1.59" W x 2.62" H with 1,934 stitches. The sewn out size for the 5" x 7" hoop is 3.35" W x 5.51" H with 9,080 stitches. The sewn out size for the 6.25" x 10.25" hoop is 5.35" W x 8.81" H with 21,117 stitches. The sewn out size for the 7.75" x 11.75" hoop is 7.01" W x 11.54" H with 34,612 stitches.